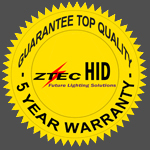 All ZTEC HID products including replacement components (ballasts and bulbs) are covered by the manufacturer standard warranty for a period of twelve (12) months from the purchase date. For customer purchases complete HID kit(s), manufacturer will extend the warranty for a period of five (5) years to ensure customer have the top quality products. Customer required to register the warranty with manufacturer within seven days of delivery to get warranty extension coverage, no exclusions. All warranty claim require proof of sale and warranty card with a $20 money order made out to CASH. The money order is for testing process and return shipping of replacement. There is a 35% restocking fee for all non-defective products returned. This includes problems with: compatibility, driver/software conflicts, improper installation, etc. Please include a detailed note inside the return package. Check out the registration instruction and claim instruction. Any defects resulting from water damage, fire, acts of nature, misuse, abuse, modification, improper installation, vehicle crash, or any type of impact. Any modification to the system or operating on a vehicle with a damaged headlight housing, will void the warranty. Also warranty will not cover the change of color or brightness of bulb. ZTEC HID | Xenon HID Worlds will not be responsible for damages to automobiles resulting from the use, misuse, or inability to use our product. If a product is suspected of being defective, please contact us as soon as possible to try to resolve any problems before they escalate. The returned product will be inspected by the manufacturer. If the product is found to be defective and covered by this warranty, it will be repaired or replaced at the manufacturer's option. Any charges accrued for removal, installation, or reinstallation will not be covered by this warranty. Customers with warranty extension plans, receive coverage for the length of their extension. All claims will be thoroughly considered and you will be contacted promptly with a resolution. Click the links for registration instruction and claim instruction. Note: ZTEC HID | Xenon HID Worlds does not endorse any illegal use of the HID conversion kits. Due to recent regulatory developments, DOT/NHTSA prohibits the use of HID Retrofit system on highway or public road in USA.